ATLANTA — In the birth city of Martin Luther King Jr., a familiar event takes place every year. It’s not the celebration of his birthday this time, or people gathering and reminiscing about his assassination on that fateful day in April 1968. For the past 17 years on the federally observed MLK Day, the NBA has taken the opportunity to honor King for all the sacrifices he made to further educational opportunities, civil rights and equality. 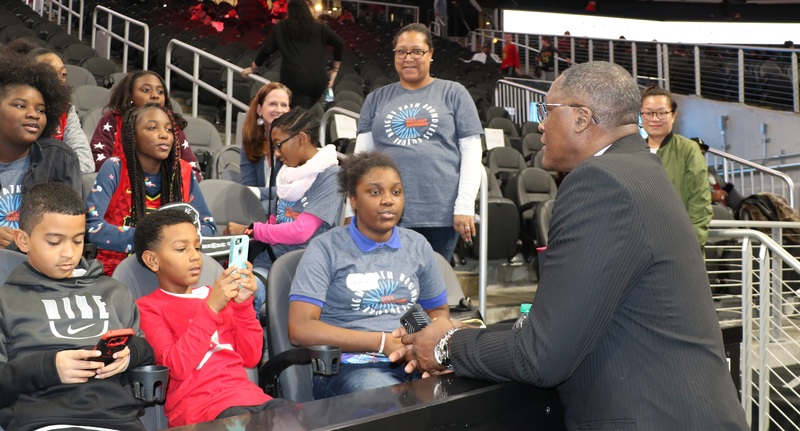 This year, just hours before the Atlanta Hawks lost 122-103 to the Orlando Magic, the team hosted local students from Brown Middle School’s mentorship program, College For Every Student (CFES) Brilliant Pathways, to participate in the Hawks’ Dream Day youth seminar. The unique mentoring partnership between the scholars and the Hawks has been a staple in the team’s community interests since August 2017. 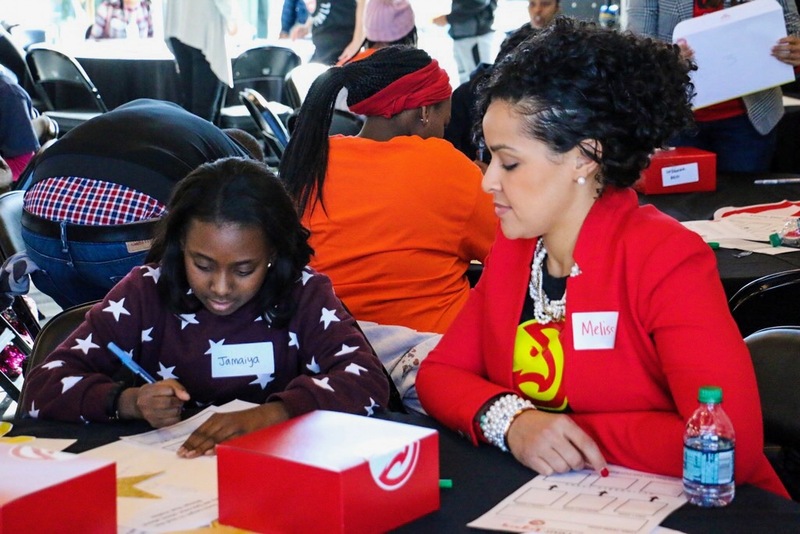 Inside the newly named and renovated State Farm Arena (formerly Philips Arena), roughly 30 students ranging from grades six through eight engaged in conversations and workshops with league staff and volunteers. The activities were mainly centered on King’s legacy of social activism and inclusion. These future first-year college hopefuls met with several key figures, including Melissa Pierce, wife of Hawks coach Lloyd Pierce; Scott Pioli, assistant general manager of the Atlanta Falcons; Atlanta Dream guard Renee Montgomery; and Hawks alum Roshown McLeod. They learned about what it means to leave a legacy, the importance of setting goals and pursuing a college education. Pierce says she has been doing this kind of work with youths for years. She did not pass up the opportunity to make sure the scholars understood what this day means to her and her husband, as well as the Atlanta community. Melissa Pierce (right) speaks with a CFES scholar during the annual youth Dream Day just before the MLK Day game. Monday’s festivities included the students watching the Hawks’ pregame shootaround, attending a postgame meet-and-greet with Hawks players, taking a VIP tour of the arena and receiving replica Hawks jerseys. Hawks alum, color commentator and NBA Hall of Famer Dominique Wilkins stopped by for photos with the participants. He shared his stance on the importance of MLK Day traditions in Georgia’s capital city. CFES scholars meet Hawks legend Dominique Wilkins (right) at Dream Day. The scholars’ day was fulfilled courtesy of Andrea McDonald, CFES director of programs and initiatives. Aside from the game and CFES scholars’ visit, other events from the Hawks organization throughout the weekend included the unveiling of a new outdoor community basketball center at Selena S. Butler Park, next to the Martin Luther King, Jr. Recreation and Aquatic Center. Wilkins and Atlanta mayor Keisha Lance Bottoms were both in attendance.